Google today introduced new features to Gmail both on the web and on mobile devices. The web version of Gmail sees the largest number of changes and adds smart features meant to help people move through their email more efficiently. The interface has been refreshed with a new design, new controls, and dedicated access to Calendar, Tasks, and Keep. Gmail users can now click on attachments such as documents and photos without scrolling through entire threads, as well as use a new snooze button to put off emails for later. Gmail's Smart Reply feature, which has been available in mobile Gmail for some time, now comes to the web. Gmail will suggest quick replies to help people push out responses faster. In the same vein, Google will "nudge" people to respond to emails if they sit unanswered for several days with gentle reminders. New security features are on deck as well, such as the ability to restrict emails and attachments from being copied, printed, or forwarded. Further, Gmail users can make a message expire after a set period of time to help them stay in control of their information. Gmail will be a bit more proactive about notifying people about potential scam messages. On mobile devices, the new Gmail adds high-priority notifications that will notify people of important incoming messages, allowing them to ignore the rest. 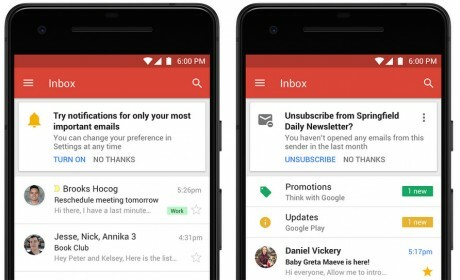 Last, Gmail on mobile devices will be more proactive about helping people unsubscribe from unwanted newsletters. The new Gmail for the web is rolling out now with some of the new features. The Gmail mobile apps for Android and iOS are available from the Play Store and App Store today. Google believes its Tasks mobile application for Android and iOS devices will help users manage and complete tasks more efficiently. The app lets people create tasks lists; view, edit, and manage tasks from any device; and control tasks created in Gmail, Google Calendar, or on the web from mobile devices.